Most people who know me well, know that I really love to play Sid Meier’s Civilization. The franchise of computer games began in 1991 with the first iteration and has since been updated and spun-off several times. To this day I still play the occasional game of Civilization (Civ). 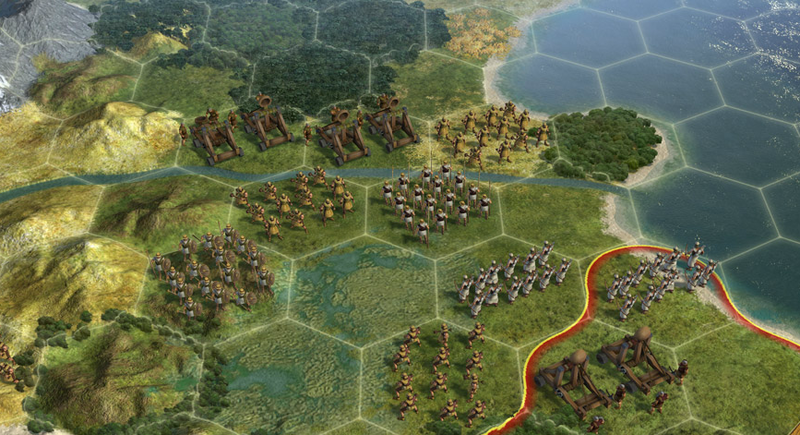 The rules and gameplay of Civ are pretty extensive. But the gist is that you are guiding a civilization (from some time period in history – e.g. the Mongols, Babylonians, Persians, Greeks, Americans or Germans) from the stone age to the space age and directing the economic, diplomatic, production, scientific, and m ilitary decisions of each of the cities within your influence. Of course, each decision has its pros and cons and influences each subsequent decision immensely. Priorities must be placed early in the game or your chances of winning at the end are harmed irreparably. The reason I write about the game now though is because a principle that is very easy to understand from playing the game is so hard for people to understand in the real world: disarmament leads to war. And yet we have had Americans harping endlessly about it since the ignorant flower-children of the sixties (who have now turned into the ignorant, pretentious, arrogant, reproducing, corruptive busy-bodies of today). When you play Civ (particularly Civ V – the latest version), neighboring civilizations are constantly measuring themselves up to you (or vice versa). Some of those civilizations are agreeable chaps (like the Siamese, Polynesians and Indians), but others are vicious brutes (like the Americans, English, Mongols, Songhai and Huns) and are simply looking for reasons to declare war. Regardless of their personalities (and regardless of the intentions of the developers), if you reveal any sort of weakness – from a city on the edge of your empire appearing undefended to not having the requisite units available for war – even the most tranquil ally will quickly become a heated enemy for the chance to improve by your pain. With the way I play Civ V, war comes to me frequently early in the game. I attempt to expand early vice purchasing military units and play a game of chicken with my neighbors. Sometimes the gamble pays off and leaves me in a much better position in the future. But sometimes this ends up hurting me considerably. There have been times when my gamble spectacularly backfires and two or three neighboring civilizations sign an alliance and attack me at the same time. I’ve had to retreat inside my cities for dozens of turns and train units to the exclusion of buildings and workers, spending all of my gold on archers and warriors, greatly weakening my kingdom, before being able to sue for peace. Now certainly I am not saying that the game is a perfect analog for real diplomacy and strategy. It doesn’t entirely take into account auld alliances or cultural similarities, nor does it fully account for the peripheral costs of war to population and production – all of which could prevent a country from declaring war in real life. But Civ does a great job of reducing conflict to its lowest, most understandable levels and illustrating the things acted out on thousands of school yards, neighborhoods, offices and meeting tables (not to mention embassies and consulates) everyday: the strong will move forward with what they want to do until a credible and ready source of opposition exists (try to find that simple principle in the typical college classroom taught by the descendents/holdovers of the sixties). Since I can’t (and wouldn’t want to) play a game of Civilization without the inherent danger of falling prey to the sword of my enemies, I have to make clear decisions from the beginning about moving forward, weighing the costs and benefits of various investments and chart a course that takes my civilization forward on the straightest, safest line. In weighing increases in science, culture, faith, gold, influence, capability and defense, some things must be prioritized over others – which means that the civilization’s survival is probably going to trump all other priorities when war erupts. But my concern is often not to go to war to begin with. In those cases, the only way to prevent war is to maintain a standing army that deters the enemy from ever starting anything beyond hostile words. And THAT is where the crux of the matter is in real life. Both the man who argues for the military’s unilateral disarmament and the man who argues for increased governmental management of his life are obtuse to the real problem: the unarmed man will always have advantage taken. We live in a fallen world, a deeply depraved and evil world, and to ignore this fact and seek to bury our heads in the sand is to become so deeply disconnected with reality that we cease to function appropriately and effectively within it. In fact, isn’t it a huge concern that we might be viewing reality through such cognitive dissonance – borne from a denial of a reality that might possibly interrupt or interfere with an everybody-get-along, everybody-love philosophy – that we can’t see a principle so fundamental that it is readily understood within a simple computer game? I defy anyone to find a point in time where there has not been conflict present in the world. In fact, I’ll do you one better, I defy you to find a point in time where a region of the world wasn’t steeped in conflict. From all out war to internal ethnic cleansing to class struggles to simple friction during drought or economic slowing, there has always been a time to be concerned about one’s political neighbors. There may indeed have been a million answers as to how to diffuse each of those situations – most even without war – but one thing that does not ever ramp-down the tension is one country disarming itself … so says Civilization, so says history, so says human nature. So if you find yourself on the side that says, “You know, we’ve got way more nuclear weapons than we need and we’ll never ever fight another ‘conventional war’ like World War II, Vietnam or Iraq, so we don’t need all of those planes, armor and ships anymore.” Then you may need to reassess your view of history and human nature … maybe even play a round of Civilization: the strong always prey on the weak (weak-minded and weak-willed) because they can, and expecting anything less is a purely unadulterated abdication of any grip on reality.